GAS IT self refillable gas bottle and gas cylinder for use in any Motorhome, Caravan, Campervan, Farrier & Catering Vehicles and Road repair companies. 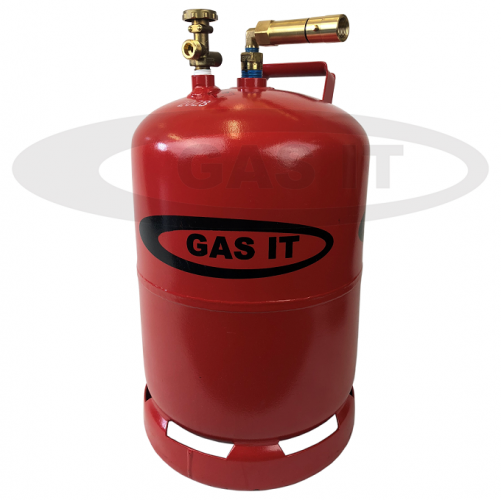 - GAS IT Leisure Gas Bottles, Gas Cylincers and Gas Tanks - Catering, Motorhome, Campervan, Caravan, Farrier and Road Repair Refillable Gas Solutions. Portable Direct Fill EASYFILL© GAS IT bottles. We are waiting for this item to at our warehouse. We currently estimate this item to be back in stock during the week of 27 Apr 2019. Delivery of this item would be after this date. Please see GI-VB-004 for more details and technical information. *While current stocks last. E&OE. Our GAS IT HORIZON©, Self Refillable gas bottle are easy to use, save you money and are super convenient to use and fill up, with LPG Gas Locker Triangle Sticker. All our GAS IT direct fill portable / Freestanding bottles come with the required TPED and Pi markings and also with the required outlet tap sealing cap for sealing the outlet tap and also a separate inlet fillpoint seal when the bottles are not in use plus every bottle is fitted with top quality German manufactured OPD - Overfill Protection Devices as standard. What makes the GAS IT refillable gas bottle system stand out above the rest. Well one of the main advantages over a single valve portable bottle is that all GAS IT bottles have 2 separate valves - A fill point with integrated Overfill Prevention Device ( OPD ) and a separate outlet tap, so whilst you can remove a GAS IT portable bottle for standalone refilling, you also have the easy option of simply driving up to the Autogas filling station and you do not have to disconnect a pigtail from the bottle to refill ( as you do on bottles with a single combined valve ). With GAS IT portable bottles, just drive up and put the fill gun on the bottle as there is no need to disconnect every time. We've also been selling GAS IT refillable bottles for over 30+ years so with the many hundreds of thousands sold you have a proven product safety, proven supply chain and proven backup. ALL GAS IT bottles come fitted with fully certified German manufactured Overfill Prevention Device (OPD) and outlet valves - you'll not find cheap Chinese or Taiwanese valves fitted on GAS IT products. 4) No having to send back part filled exchange bottles, just incase you need more gas on the next trip. This GAS IT bottles come with our GAS IT HORIZON© Fill point fitted so you can fill with ease directly on the bottle. Its also fitted with a gas contents gauge to show you what gas is left in the bottle, an 80% automatic shut off fill system making the refilling process childs play as it will only replace the gas you have used by returning the gas bottle back to its 80% fill state so there is no measuring or guessing when filling with a GAS IT refillable bottle., also connecting a GAS IT bottle to your regulator is no harder than you using your normal exchange type gas bottle. This GAS IT brand of 11kg Refillable gas bottle is designed to be refilled with cheap Autogas at an Autogas/ LPG station in the UK and Europe. Autogas is normally sold several times cheaper than renting and exchange your normal brand of exchange gas bottles plus you have the luxury of being able to fill up when you want, and where you want. so you'll never run out of gas again. GAS IT bottles and valve system are manufactured in Europe and are fitted with an automatic 80% shut off fill system, meaning you simply attach the Autogas pump to your vehicle mounted LPG fill point, and when the gas bottle is 80% full, it stops filling. With GAS IT's proven refillable bottle meaning you can fill up when. and where you want, but all GAS IT bottles come with a gas level content gauge which gives you an indication of what's left in the bottle. Do you want to keep your existing exchange type bottle as a spare, or use it till you've used all the gas in it? No problem. Its easy to have any mixture of GAS IT self refillable bottles and exchange type gas bottles. Here's the GAS IT technical bit. The gas outlet on the manual tap of this GAS IT Bottle is the UK specification 109 nut (21.8 LH) thread which is known as the butane nut & fitting. If you have a large blue gas bottle currently you will be fine but if you have a red bottle Propane pigtail ( UK POL) fitted to your existing gas install, then you can either buy a separate new 21.8 LH pigtail or a pol to 21.8LH adaptor - both are available from ourselves at an small extra cost. These GAS IT Refillable products are regularly used in the Caravan, Motorhome, Road Repair, Catering and Farrier industries. Our GAS IT Technical team can advise you of all our GAS IT items functionality and regulation compatibility within your industry and use. We can even work with you on designing a GAS IT system unique to your needs. Height: 550mm height x 304mm diameter. Our GAS IT Bottles can be paired up with any self refillable gas bottle like the Gaslow, Alugas, Prakto, RV and many more, meaning partnering them with your existing refillable bottle is possible. Whilst filling directly on the bottle is a recognised practice in the UK with the right approved gas bottles and accessories, some LPG forecourts and Autogas service stations might not allow this practice in their own terms and conditions and we have no control over this. We can also not confirm if you are allowed to fill these types of bottles outside of the UK.